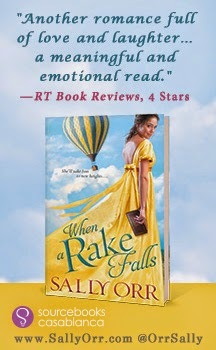 Today I've got some additional goodies with my review of When a Rake Falls. All of these extras have been provided by the publisher, Sourcebooks Casablanca - just like last week's Bite at First Sight extras, and I'm loving having the extra material to pass on to you guys! Goodies include: an excerpt from the book; some information about the author, Sally Orr; plus a Rafflecopter giveaway from the publisher. Come check things out! I really liked the cover - it's so bright and eye-catching. Having hired a balloon to get him to Paris in a daring race, Lord Boyce Parker is simultaneously exhilarated and unnerved by the wonders and dangers of flight, and most of all by the beautiful, stubborn, intelligent lady operating the balloon. Eve Mountfloy is in the process of conducting weather experiments when she finds herself spirited away to France by a notorious rake. She’s only slightly dismayed—the rake seems to respect her work—but she is frequently distracted by his windblown physical magnificence and buoyant spirits. What happens when they descend from the clouds? The most significant element of When a Rake Falls, for me, was the hero, Boyce. Boyce is a very different sort of hero - he's charming, he sings, and he's a bit flighty. For once, the hero is a bit of fluff and the heroine is made of sterner, more scientifically-minded stuff. Except that Boyce isn't quite that superficial, and I did find him to be rather delightful. I appreciated that he had some emotional depth to balance him out. Eve was, honestly, about what I expect from historical romance featuring a 'smart heroine.' She works as her father's assistant, is keen to make her own mark on the scientific community and eschews more feminine pursuits. She was likeable enough. One thing that irked me about When a Rake Falls was that I kept getting two female characters who enter the story mid-way confused with each other. Because they are daughter-in-law and mother-in-law, and because of the different ways in which characters interact with them, it's rather important to have them clearly in mind as separate, but for some reason, I kept mixing them up. Unfortunately, this book was kind of meh for me. It had some good ideas, but I didn't find myself really embracing the story the way that I wanted to, and I can't quite put my finger on why that was. Perhaps the story itself feels a bit fluffy? I don't know. 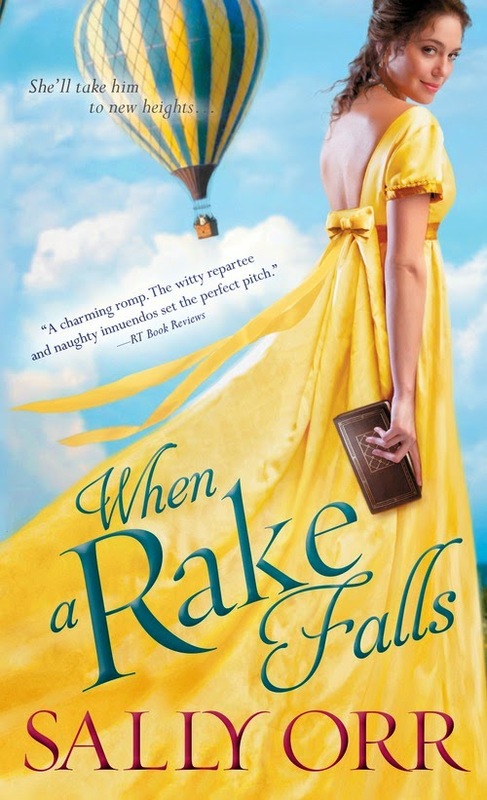 When a Rake Falls is a lighthearted historical romance that I enjoyed well enough. Suitable if you're looking for something a bit whimsical, perhaps? The Earl of Stainthorpe stepped to the edge of his balcony overlooking Royston Square. “My friends, I understand there are no great men left in England.” Silver wisps of hair escaped the earl’s old--fashioned queue and blew over his forehead, but he ignored them as he squarely confronted the men below. The audience surged forward and yelled retorts to the earl’s audacious remark. The man smiled and shouted. Standing two steps behind his master, the earl’s butler vigorously rang a handbell to gain the attention of the boisterous crowd. As the youngest son of a marquess, Boyce was considered an Eligible. Only, Lady Sarah had rejected him, and all the other Eligibles, seconds after they had presented themselves at Royston House—-an unfortunate circumstance, since he believed Lady Sarah would make an excellent wife and a very pretty one too. After a moment of reflection, he realized every lady of his acquaintance would make a pretty wife. One or two may have a feature some might call “unfortunate.” Nevertheless, he always found something pretty in every female countenance. With his free hand, the man doffed his top hat. All of the Parker men possessed a fine figure, so he knew even a poorly tailored coat hung well upon his shoulders. The many compliments he received had gained him a reputation as an expert in masculine fashion. Therefore, Boyce felt his lordship should show more sympathy to a man wearing a lamentable violet greatcoat, since the earl wore an old square coat and baggy breeches. “Gin drinking, gov?” someone shouted. The mob erupted in huzzahs; top hats flew into the air. Under his sky--blue waistcoat, Boyce’s heartbeat escalated. This race presented him with his best opportunity to distinguish himself. He would win at least two of the earl’s challenges and earn a reputation as a prime example of English manhood. “Huzzah!” He too threw his beaver hat in the air. The butler rang the handbell for a full minute before the crowd settled down. The assembled men danced in circles. Each one of them was probably dreaming about how he would spend his winnings. Eager to hear the details, Boyce frowned at the clamorous riffraff behind him. The earl was right; they all appeared to be a lot of rag--mannered coves, so he gained complete confidence that he could best any of their English traits—-whatever those traits may be. Once he reached Paris, Lady Sarah would discover he was the finest of fellows and they would fall in love. Women seemed naturally to favor him over other gentlemen—-wonderful creatures, women. The young men below the balcony tendered several improper suggestions. Someone shouted the nature of what was coursing through his veins. Others in the crowd shouted similar generous offers. Boyce wondered how a fellow could show loyalty to the king in a race. He supposed a gentleman might salute the king’s profile on a sovereign with every step of his journey, but dismissed it as an absurd notion. No, he’d be better off trying to provide a service to some lady. Shouts and laughter rose from the rabble. The mob tendered several humorous jests of questionable wit. Several groans were heard, and one person clapped. The crowd’s cheers erupted again after the mention of the winnings. Shouts and applause echoed around the square.